I am so so excited to bring you a recipe again today from Erin of Carosello. since I am not so good in the kitchen/ DIY area and she is AMA.ZING....(not only does she create incredible things but her presentation is BEAUTIFUL), I have asked her to help me out in these areas! She is truly an inspiration with all of her creativity. Today she is bringing you this fabulous recipe! Beat your eggs and salt (best at room temperature) until frothy, add cream of tarter and beat until white with soft peaks...slowly mix in fine sugar and beat until you have stick peaks. My mixer (kitchenaid mixer) I beat on high for 2-4 minutes checking the peaks often. Don't over beat because your meringue will not stick. In a seperate bowl sift your almond flour and powdered sugar together. Add this mixture into your meringue and fold in with a spatula. The mixture will be grainy and paste-like. Add almond flavor and fold as well. Place all of your mixture into a large piping back or gallon size ziploc bag and cut one small corner. Pipe out quarter size rounds onto a baking pan covered in parchment paper. Let this sit for 20-25 minutes and heat your oven to 375 degrees. Once your macarons have set place them in the oven and turn your oven to 325 degrees. Bake for 10 minutes rotating your pan halfway through. For each additional pan be sure to turn your oven back up to 375 degrees. Combine your two marshmallow (the topping and the fluff) stir until nice and blended. This is what I used as the filling. You can also try just the marshmallow ice cream topping if you want. I think that work just fine if you don't want to buy both. Let your macaron disks cool slightly then remove from parchment paper and place on cooling racks. 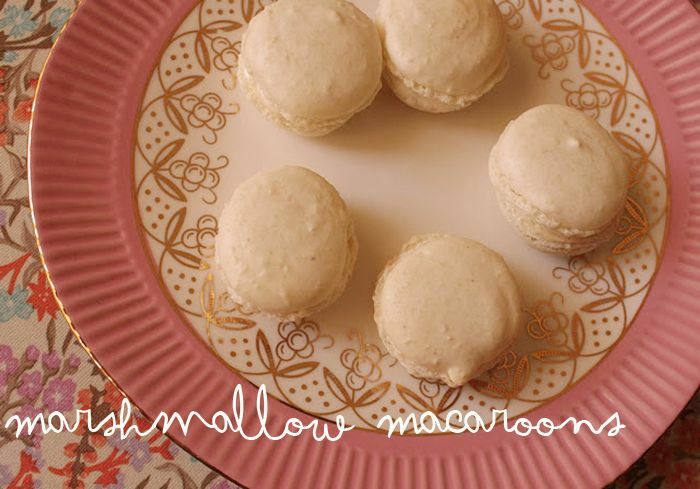 Choose two like sized macaroon disks and fill with a marshmallow filling then sandwich together.